The Nest Cam security camera is currently the most popular remote home monitoring system with easy do it yourself installation. It has easily overtaken and improved upon the Dropcam Pro after Amazon bought out this brand. This camera provides continuous live streaming directly through your internet connection. You can access the Nest Cam 24 hours a day through a smart phone application that is included with the camera (available for both iOS and Android). Reviewers rave about the quality of the image. The Nest Cam uses a 100 percent pure glass lens that provides a crystal clear, high resolution (1080p) 130 degree panoramic view. The cam also has an impressive night vision mode that allows you to see a very clear image of an entire room in total darkness. The smart phone app can be used to pan and zoom the image remotely, thus revealing even more detail than a stationary image normally would (this does not physically move the camera). You can get customized motion detection alerts and sound alerts via your cell phone. The Nest Cam uses advances technology to distinguish between background noise (like traffic noise or wind rustling through the trees outside) and foreground noise (like a window break-in or baby crying). It also distinguishes between background movement (like tree branches swaying outside a window) and foreground movement (like a cat jumping on your couch). The one significant downside that users have noted is you can only receive up to one sound alert or motion alert every thirty minutes. However, the continuous recording will be maintained in the cloud if you are subscribed to Nest Aware. The base of the video camera is very well designed and makes set-up highly flexible and easy. It can sit the cam on a flat table top and the neck can be swiveled into the exact position you want. The home security protection device also has a strong magnetic ring on the base so you can easily attach it to a metal object such as a file cabinet or refrigerator. A wall mount is included as well and it can be easily attached to a standard tripod mount. 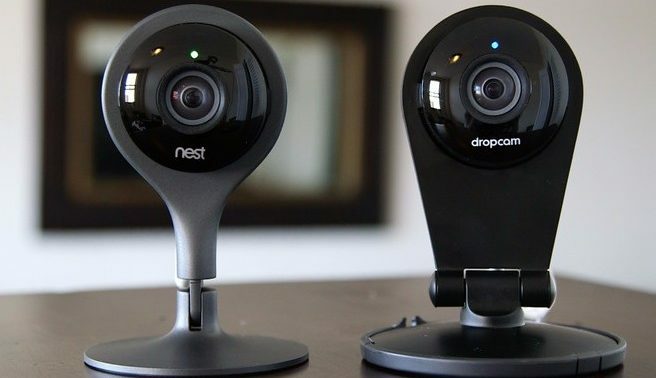 The Nest Cam does not provide local storage of video and sound but both can be stored in the cloud using the “Nest Aware” service for a nominal fee of only $10 per month. When you purchase the cam, you get a 30 day free trial period to try out this service. You can add additional cams to the service for $5 each per month. The remote video surveillance camera can be used for far more than a security cam detecting burglars, vandals, trespassers, and other unwanted intruders (like the neighbor’s cat digging up your flowers or the rabbit who is getting past your garden fence somehow). It can also be used to help monitor your children, elderly family members, pets, bird feeders, and farm animals (you could determine how predators are getting your chickens). You can also check up on babysitters, pet sitters, dog walkers, nosy neighbors, handymen, service people, and deliveries. Not only can you see what’s happening remotely, you can also listen in and even speak directly to the people and animals in the room. For example, you could remotely comfort your cat or dog during a thunderstorm or verbally tell them to stop scratching your furniture. The home security monitoring tool will even allow you to regulate your thermostat remotely, when integrated with the Nest Thermostat, which must be purchased separately. How Much Does the Nest Cam Cost? The Nest Cam is priced to fit almost any budget. It can be purchased for just under two hundred dollars, usually with an exact price tag of $199.99. If you search the internet for “nest cam discount code,” you can often find coupons for up to $100 off. Even if you can’t find a half price promotional coupon, you can almost always find one for ten to thirty percent off. You can also save significant money, about $100, if you buy a three-pack. Once you learn how well the video surveillance device works, you’ll want to protect other areas of your home. Buying in bulk makes great sense. The Nest Cam security camera can be purchased at many retail stores and online outlets. These include Best Buy, Home Depot, Lowes, Walmart, Target, Sam’s Club, Amazon, the Google Store, the Apple Store, and the company’s own online store. Most online outlets that sell the Cam security camera offer free shipping. Also, you can also find both new and used Cams on eBay. For some people, the best place to by the video surveillance device will be from a retail outlet like Best Buy where you can check out the demo they have set up. However, you can often find a better price if you search for discount codes and buy online. There are several accessories for the you can purchase separately. The Nest Thermostat allows you to regulate your thermostat remotely. There’s a smoke and carbon monoxide detector that will work in conjunction with your video security monitoring system and send you alerts if a problem is detected. Weatherproof outdoor enclosures are also available which come with a heat sink to cool down your cam in hot weather. These can be used not only for security (like who is stealing your newspaper or mail!) but also for things such as seeing what wildlife may be visiting your property, which owl species are hooting at night, determining how the bears are getting into your garbage at night, or watching a bird feeder remotely. You can also buy longer USB power cables or various types of extended mounting arms if you need them. The security camera has become the gold standard for internet connected DIY home security and home monitoring systems. In fact, it is currently the #1 best seller on Amazon in the category of remote home monitoring systems with more than 1700 reviews. It is also highly affordable on almost any budget. If you have any questions or comments, please post a message below. Also, learn about the Nest Secure Alarm System and other Home Security Systems.